See in Glossary’s Transform component. See in Glossary will be used for reflection. See in Glossary motion vector Texture. See Renderer.motionVectorGenerationMode in the Scripting API reference documentation to learn more. See in Glossary Static then it can still be lit using Light Probes. See in Glossary A list of Materials to render the model with. See in Glossary should be performed for this GameObject even if it is not marked as static. 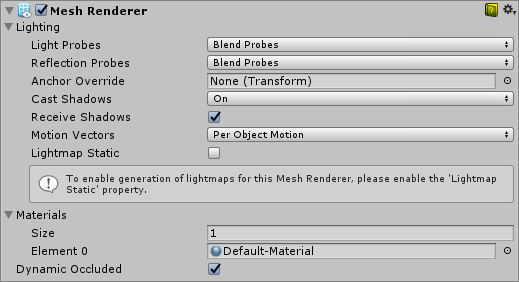 Tick the lightmap static checkbox to display MeshRenderer Lightmap information in the Inspector(see also the static checkbox of the GameObject). See in Glossary (ie, the lightmap resolution) used for this GameObject while a value less than 1.0 decreases it. You can use this property to optimise lightmaps so that important and detailed areas are more accurately lit. For example: an isolated building with flat, dark walls will use a low lightmap scale (less than 1.0) while a collection of colourful motorcycles displayed close together warrant a high scale value. 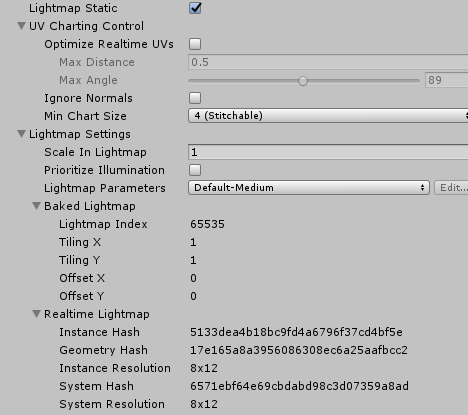 Prioritize illumination Check this box to tell Unity to always include this GameObject in lighting calculations. Useful for GameObjects that are strongly emissive to make sure that other GameObjects will be illuminated by this GameObject. Lightmap Parameters Allows you to choose or create a set of Lightmap Parameters for the this GameObject. See in Glossary on that sub-Mesh - but note that this can impact the performance at run time. Also note that fully opaque Materials, simply overwrite the previous layers, causing a decrease in performance with no advantage. See in Glossary. The lighting across the GameObject matches the lighting at the anchor point, and if the GameObject straddles a lighting gradient, parts of the GameObject look incorrect. See in Glossary where the resolution of the grid can be user-specified. The spherical harmonics coefficients of the interpolated Light Probes are updated into 3D Textures, which are sampled at render time to compute the contribution to the diffuse ambient lighting. This adds a spatial gradient to probe-lit GameObjects.